The murals of 2017 were a dream come true for many, including the Mural Mice. 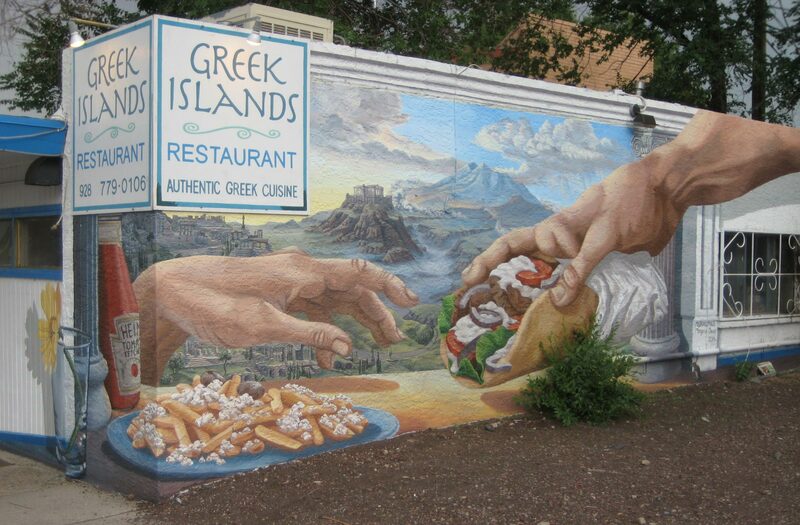 The Mice produced a total of eight murals ranging from 300-500 square feet each. In Spring 2017, the Mural Mice took a journey to another world. Their mission? 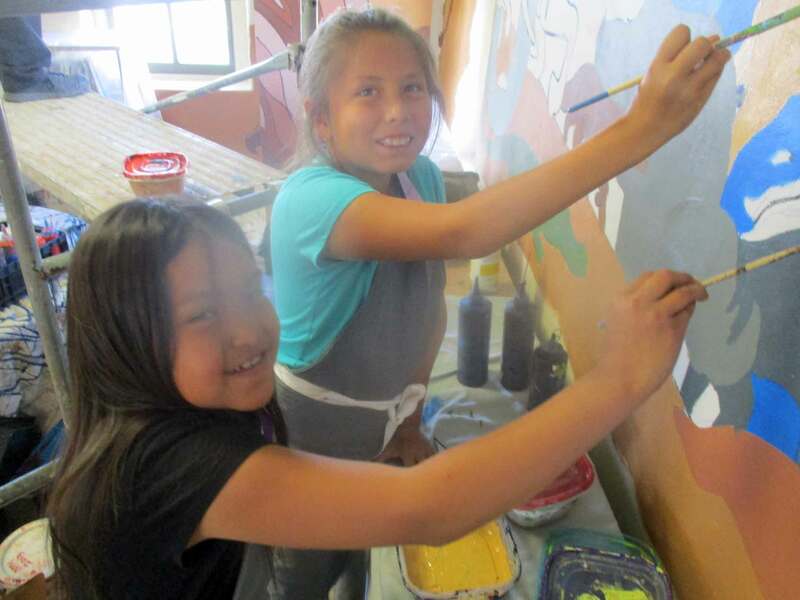 To paint the childrens area of the Tuba City Public Library on the Navajo reservation. 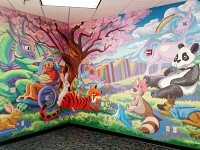 Moreover, they would request that the library community design and paint it with them. They rose to the occasion with colorful flair. 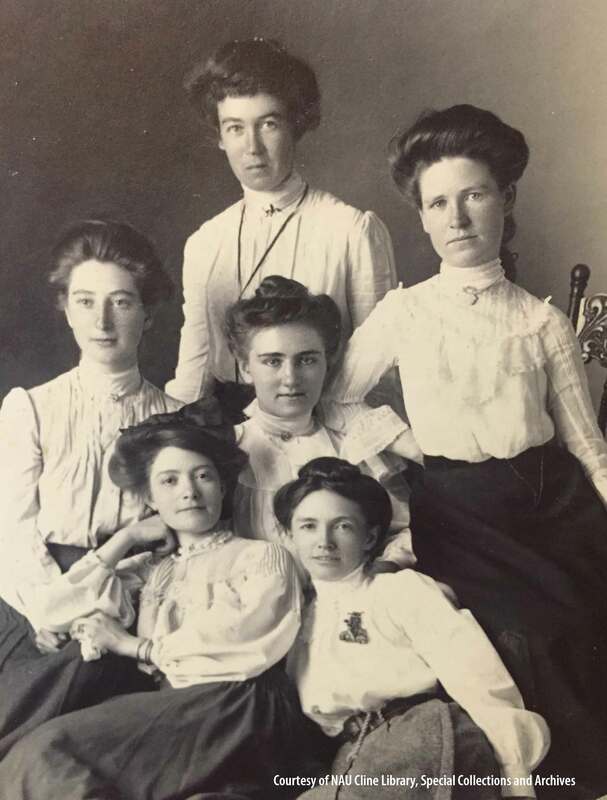 The project was supported by the Arizona State Library, Archives & amp; Public Records, a division of the Secretary of State, with federal funds from the Institute of Museum and Library Services. Let there be flight! The Sound of Flight mural on the East-facing wall of the Orpheum Theater in Flagstaff Arizona is complete and all the birds are chirping about it. Sound of Flight is the brainchild of local artist Sky Black, a 23-year-old native of Flagstaff, who always wanted to leave his mark in town. He brought in veteran muralists R.E. Wall and Margaret Dewar from Mural Mice Universal to help make his dream a reality. 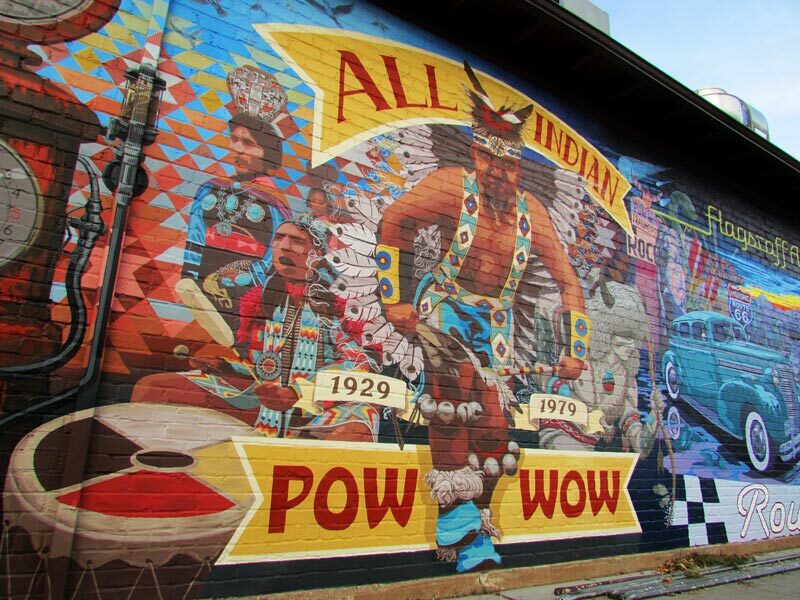 The 4500 Square foot mural project took 14 months to create. 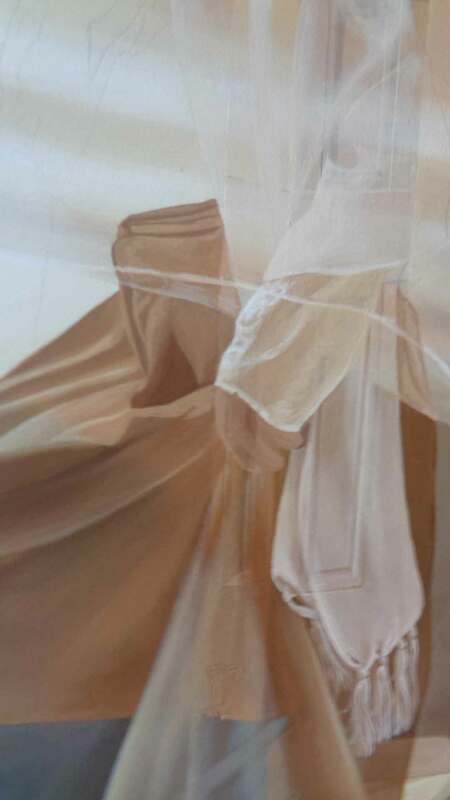 It took six months to raise funds and eight months to paint. 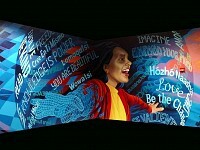 The project is now regarded as the largest mural in Arizona. 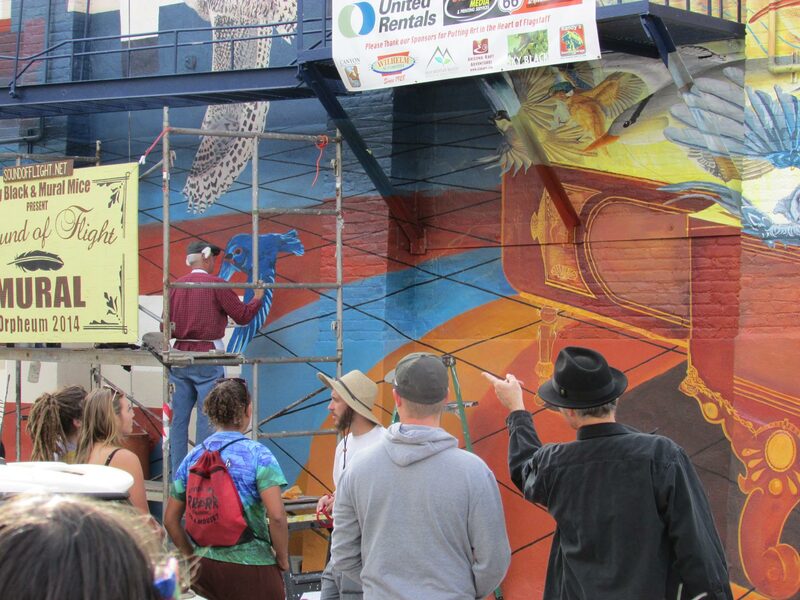 Kindness Revolution Mural 2015-Flagstaff Az. 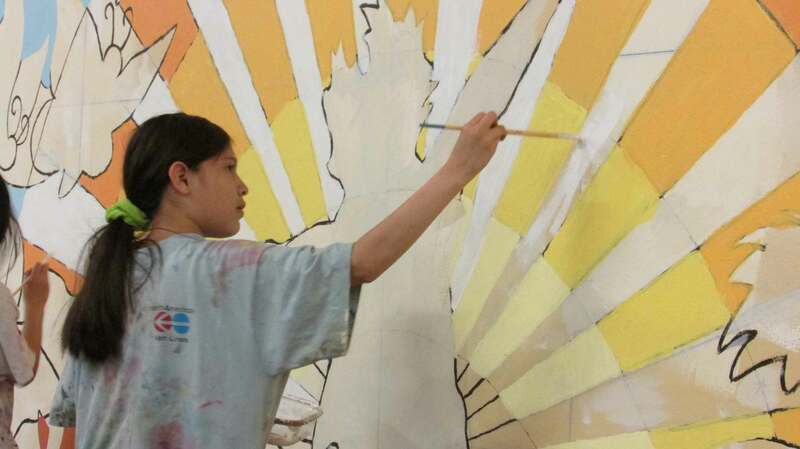 Its time for a little kindness and Killip Elementary School on the sunny side of Flagstaff is shouting out loud with a brand new mural! 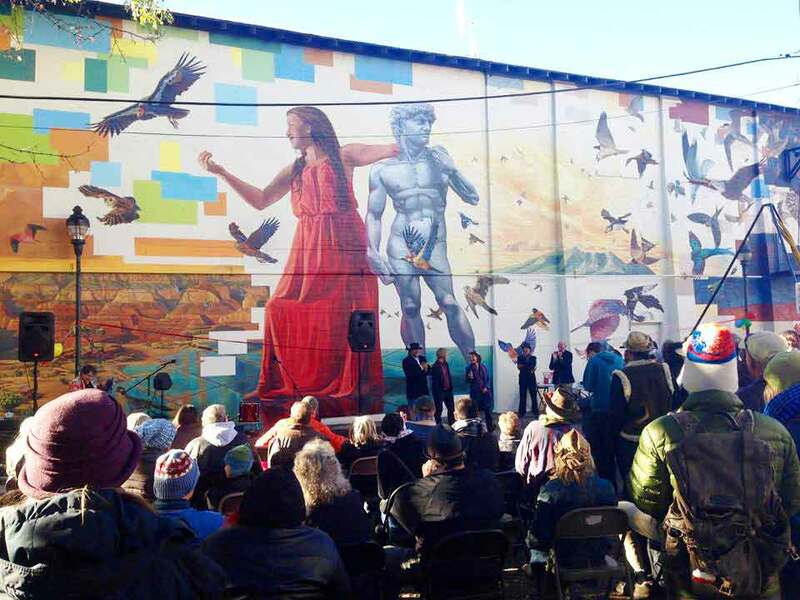 On Saturday October 18th, 2014, Flagstaff Mayor Jerry Nabours was the star attraction at the Orpheum Theater mural entitled “Sound of Flight”. 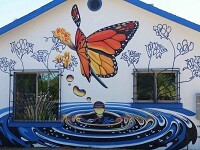 The mural, painted by local artists Sky Black and Mural Mice R.E. Wall and Margaret Dewar has been a work in progress for the past three months. Described as a “Symphony of Color” by Shanto Begay, the mural depicts over 100 birds flying out of an antique grand piano in a burst of light. Phase one of the project received $25,000 in support from grass roots community donations and sponsors with an additional $10,000 committed to phase two, which begins next summer. A Crowd Funding campaign offered original art, prints, calendars and an opportunity to paint one of the birds on the wall. 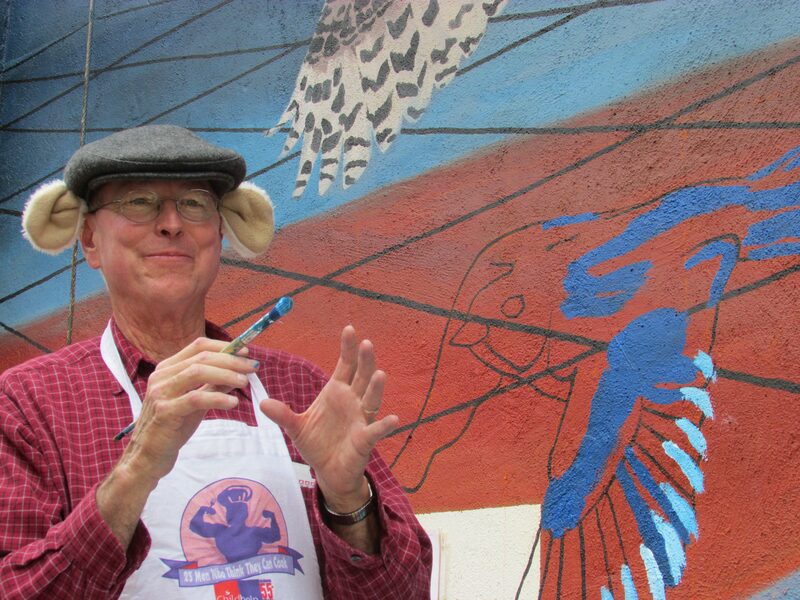 Flagstaff Mayor Jerry Nabours and family members of Sky Black jumped at the chance to paint alongside the artists. As well as being the Mayor of Flagstaff, Nabours has a minor degree in art. Nabours commented that, “the city needs to invest more into projects like this…I had a fantastic time.” Throughout the day of painting, crowds of people gathered to watch as he flexed his painting skills giving him a sample of the support the community has for public art. Phase one of the “Sound of Flight” mural will be complete by the first week of November. 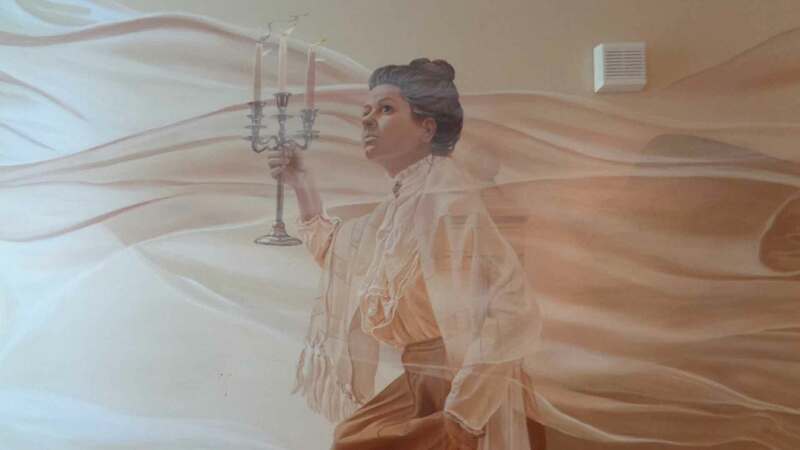 Visit the mural, and if you like what you see, support phase two of the project by going to www.soundofflight.net and making a donation. 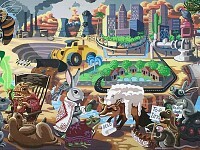 Flagstaff Arizona is getting a Mural Mice Mousterpiece. 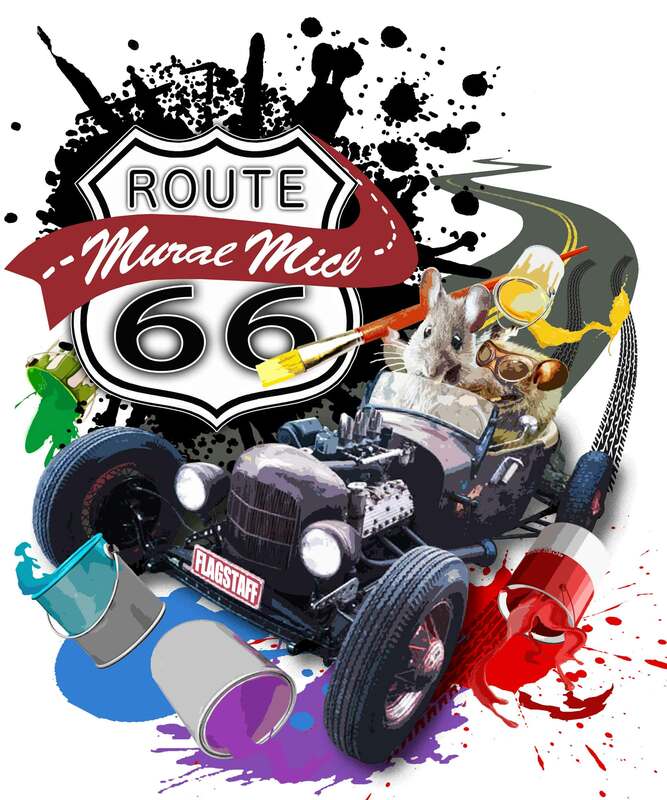 The newest mural entitled the "Phoenix Avenue Route 66 Mural" is under construction throughout the summer of 2013. Its located on the south side of the Lumberyard Brewery at 5 South San Francisco street. 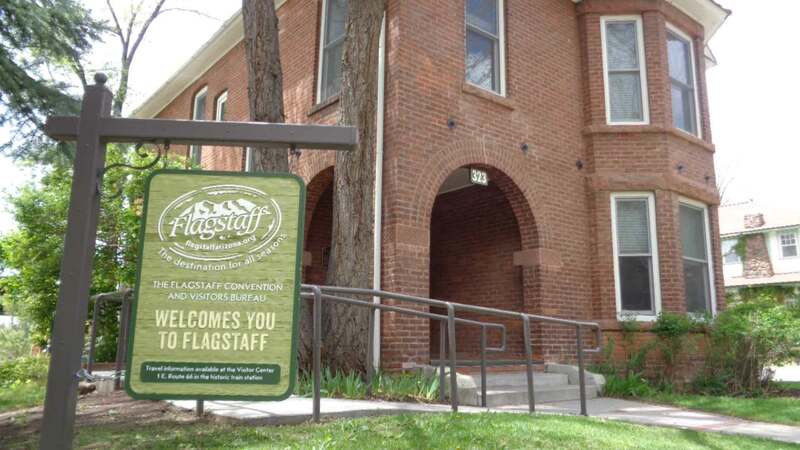 The project is being commissioned by the Flagstaff Beautification and Public Art Commission BPAC with bed, board, and booze BBB tax funds. Everyone knows summer in the Valley is hot. 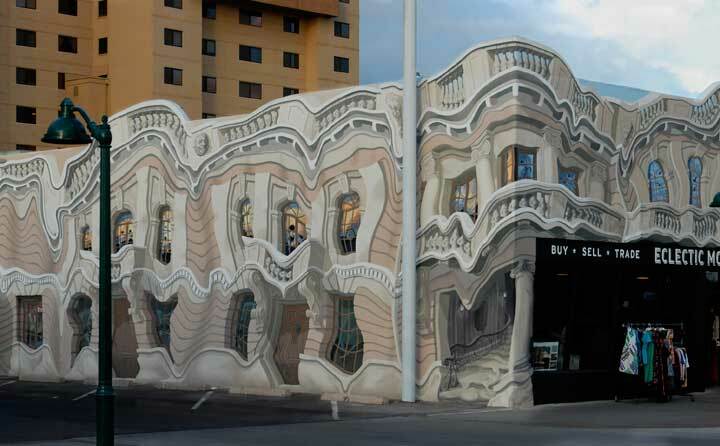 So hot, the buildings are melting! That is the theme of “Melting Point,” a new mural on display at 220 W. Main St. in downtown Mesa. The image of a turn of the century, classic building covers the entire exterior of the store, dripping and sagging on its foundation. This new work is turning up the heat in downtown Mesa.